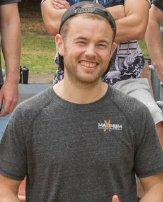 Maximum Potential Calisthenics is now open in the UK! We offer PT and classes in the Chichester – Bognor Regis area as well as Online Training options. Click on the button below to book or enquire about training with us. Guy Cartwright is our trainer based in Chichester, you can read about him on the Guy Cartwright page. If you’re not in the Chichester area, then you may want to train online instead. You can Contact Guy via the Contact Us-UK page or have a look at the Online Calisthenics Training page for more information. Guy is our new Personal Trainer based in the UK. We asked him a few questions about his journey into his Calisthenics and fitness.